4. Efficient Energy Planning: Zone and sector placement with slope and other factors are taken into consideration for maximizing our time, energy, and monetary resources. Zone Planning refers to the placement of elements based on their intensity of use and management. 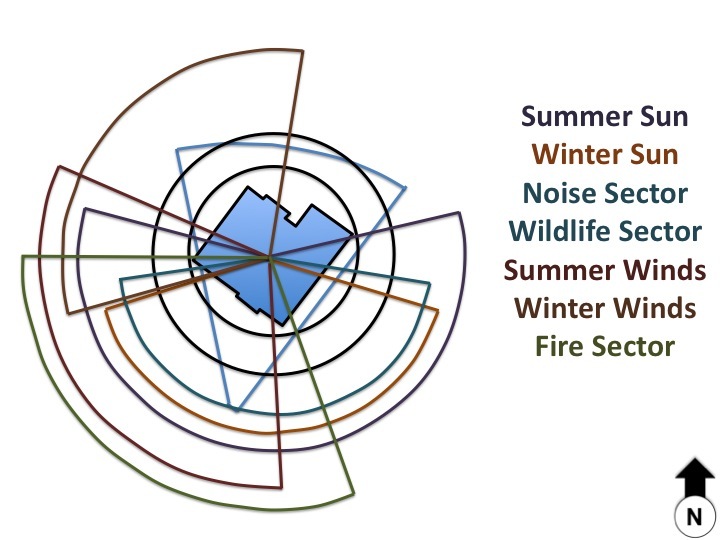 Sector Planning is about placing design components to manage incoming wild energies to our advantage or to mitigate their effects. Slope means looking at a site in profile to maximize energy flow- i.e. gravity and convection. The efficiency of energy is directly tied to economics as Bill Mollison states in his Introduction to Permaculture book. Planning to conserve resources and money is essential in any good design. Thus we use zones, sectors, and slope in where to place elements such as structures, animals, and water features. Common sense planning is inherently construed through Permaculture design, which I do believe P.A. Yeomans was the first to bring intelligent design to the west in terms of agricultural development. He laid out the Scale of Permanence, which I do believe is where the idea of design and in particular this principle stems from. 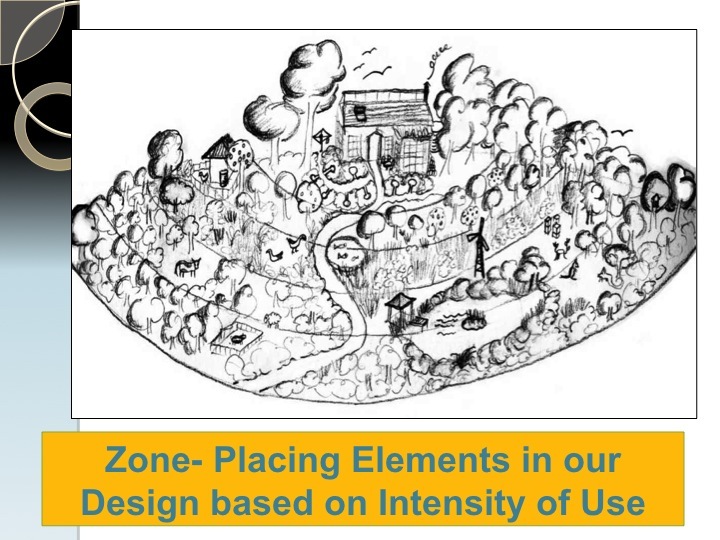 Zones defined by Mollison is placing elements based on the intensity of use and management. Through functional analysis, we learn how often and when we would need to visit animals or plants. For example goats like broad areas to roam including brushy and forested areas, but if are intended for milking need to be dealt with at least twice a day. This forces us to put the animals closer to the house but not too close as possible smells and noise should be accounted for. However a pecan tree (Carya illinoinensis) needs to be only visited a handful of times to check on its flowering stages and then the subsequent harvest. So we place the goats closer to the house than the pecan tree as our attention must be directed more often to the goats. Thus we place elements in zones 0-5 based again on management and intensity of use. Zone 0: the house or center of initiative while some also the inner landscape or heart space. high intensity of use and lots of time there. could also be a workshop, a barn, or commercial kitchen depending on the site. Larger sites such as ecovillages or braod-acre farms will often have numerous centers of initiative. Zone 1: plants and animals require pruning, mulching, watering, and daily feeding for example. rabbits, guinea pigs, worms or salad beds, herb gardens, vines for shading the south or western portion of the house, and herb fruit trees such as a dwarf lemon in the mediterranean climates. Water features would include tanks and roof collection system, grey water, outdoor shower or veggie washing station, and tyre ponds. Worm bins help to maintain fertility and cycle nutrient flow from the household. Zone 2: still items that would be used intensively but spaced further from the zone 0. Fruit trees on dwarf or semi-dwarf rootstock, poultry, and dairy animals housing finds itself jutting into a zone 2. While zone 1 gardens would have cherry tomatoes as they require daily picking, zone 2 would have larger tomatoes for drying, canning, or fresh eating. Both need water, maintenance such as pruning, mulch, and feeding so they are located near the house and carefully tended to. The zone 2 is larger and can also feature larger aquaculture ponds and water harvesting features such as terraces, swales, and rain gardens. Hot compost piles using products from gardens, animal pens, and leaf fall can be used to maintain fertility. Can be applied in solid form. Zone 3: less intensity of use and broad acres application begins with extensive plantings of garden staples such as corn, pumpkin, and potatoes. larger pastures for animals exist with rotation often occurring with electric fencing. Trees of larger size such as fruits on standard rootstock and many nut trees can intersect here. Food forests can go in either zone 2 or 3 and the integration of animals with tree crops often happens in zone 3. Plantings for firewood or polewood such as a coppice woodlots of hazel, willow, and black locust may occur. Cold compost piles of branches and trimmings can and weeds in the early establish of the forest garden can make pockets to spread after a long, slow break down process. Fertility from zone 1 worm bins or zone 2 thermal compost can be applied in liquid form to bigger areas. Irrigation ponds as well as biomass producing chinampas or ponds may be sited as well and connected to zone 3 mulching or zone 2 composting. liquid feed on broad-acre used with making compost tea or extract. Swales, keyline, and contour terracing can alter hydrological cycles and aid in reforestation. Zone 4: extension of our broadacre pastures for sheep and cattle with tree crops hopefully lining the fence rows. Forestry plantings for timber and forested areas yielding non-timber forest products such as mushrooms and medicinal herbs. Large nut trees such as oaks both for food, timber, and wildlife reside here. Keyline design could also be applied here and using animals such as cattle to repair water cycles is often used. Large irrigation ponds when sited appropriate. While this picture does depict the sort of perfect landscape, natural systems will reroute the concentric circles displayed. because natural features such as rocky outcroppings or steep drop-offs are present on permaculture sites changes will occur. For example at a permaculture school garden in Portugal, i have witnessed just outside the door a huge set of rocks that the children love to play on but make a unfarmable space other than the odd pot here and there. THis forces the zone 1 and 2 to be pushed further away than normal. Also zone thinking can be altered by having a long zone 1 wedge running next to frequently used paths. Lastly zone thinking can be applied to small-scale thinking of an individual garden beds lettuce on the edge while brocoli further in) or even to how with even fit within a bio-region. Below is a depiction of a sector map. Pie shaped wedges give value and direction to the wild energies. This is a common tool used in Permaculture design but as stated above with water it can be limited. Thus use this in combination with an Analysis of Flows to really see as the energies flowing on a site including a more detailed look at water, wildlife, nutrients, and human traffic. The final aspect that must be looked at is slope. Whether it is carting things up and downhill, or how you move energy through a site, slope is extremely relevant to efficiency of energy. Placing dams at their highest level so we can use gravity is a very important aspect of siting. Also building a house in middle of a slope allows you to gravity feed water but also stay out of the temperature extremes of the ridge and the valley. There frost and high winds tend to dominate while the middle retains qualities of both especially frost drainage. Also heavy materials such as timber can be easily brought downhill while food stock like grains can be brought up hill. On a smaller scale grow lettuce below the house while harvest of potatoes should take place above the house. That way the wheelbarrow full of spuds glides downhill to the house or to a nearby root cellar. I fortunately have been able to see a village in Bulgaria named Shipka designed exactly this way. Mountain water diverted form a stream serves for irrigation, all the houses are orientated to the sun with grape arbors slowing the summer sun, forest above the village, shepherds and grain fields below with each villager gardening. Exchange of nutrients worked perfectly with the forest raining down and the manure cart from the stables coming up by way of horse. It was a village sited in antiquity and land held in commons during the communist rule. Now the social fabric rips apart. hi doug, i m pietro from south italy, i was reading your suggestions: thank you! my eye fell on the photos and i realized about two things: you designed a site in portugal, and the cooking/warming stove between the table and the keyboards. could i ask you 2 questions? -about the stove: i m used to know rocket stove and northeast italy stube, how does that stove works? it s a pirolytic one? hi pietro thanks for the comment and feedback. I am not understanding the first part about the stove and keyboards? in this particular article i show multiple zone 0’s but they are different buildings. i am not sure which stove picture you mean either. please direct me more. as for questions two. hmmm. i used to be a native plant guy when i started in ecology from my studies. when i met permaculture i was very resistant as well to anything non native. in portugal one of my beds where i grew tomatoes last year would necessitate calling tomatoes an invasive as in just 6 square meters i have hundreds of tomato seedlings this year. they are from central america but because its a food source i guess its ok? so i take a more zen approach to “invasives”. first i think that word was created to sell herbicide. Second if nature called for a non native nitrogen fixer i have to believe it knows what it needs. I have seen black locust, robinia, in north italy, and it growing in the same context of chestnut terraces. I dont blame it on the tree i blame the abandonment and the people who cultivated those terraces improperly for the need of nitrogen. nature simply responded. i understand completely about invasives, we have a few species rampant on my families land in Kentucky, USA. i am constantly managing the 16 ha of native food forest there by cutting the invasives. Its a big work as they coppice but i love all the biomass. If you cook only with firewood and heating as well, then the robinia will be your best friend. so its a matter of working with, not against, turning problems into solutions. as for adding new black locust, well if you have alternatives try and use that one for sure. Black locust is native to the humid temperate forest of north america where i am from. Minus 25 C in the winter and it does go nuts in italy, at least in the north. bees love it as well. so…. yes we have applied permaculture to the Mediterranean at our site here in coastal portugal. i have done it all around the world, same pattern, different details. learn the pattern and the abundance follows. if you keep reading around this online book you will hear many personal accounts of how i have used elements, strategies, and the techniques that i feel reflect permaculture principles and ethics. Its exactly the point of this website so i cant answer it completely here in this reply. hope this helps. thanks again for reading and commenting.